I make the bread dough in the bread machine. If I am cooking pizza on a day that I am at work then I set the bread machine to delay start so the dough will be ready when I get home. Eat one, freeze one!!! Here is an easy no cook recipe for the Pizza Sauce. This is enough sauce for 2 pizzas or 1-13×9 inch pizza. Mix and spread over pizza. 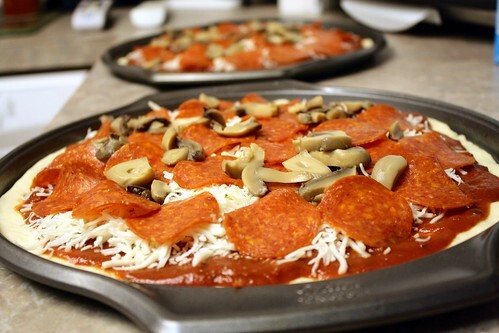 Top with cheese, pepperoni and mushrooms (or your favorite toppings). Cook at 425 for 25 minutes. Posted on January 3, 2014 January 3, 2014 by cookingwithpizazzPosted in Freezable, Main Dishes, Make AheadTagged Food, Freezable, Italian, Main Dish, Make Ahead, Recipe.